Figure 5 shows an AC/DC conversion system using switching elements. Whereas in the transformer system, first the 100VAC is transformed to a smaller AC voltage by a power transformer for the rectification. In the switching system, first the 100VAC is directly rectified using a diode bridge. 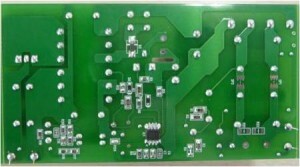 Consequently, the diode bridge should meet the high voltage requirement. The 100VAC, at a peak value, measures about 140V. In the next step, a capacitor is used to smooth the rectified high voltage, and in this case also, a high-voltage capacitor is required. In succession, the high DC voltage is chopped through the on/off of the switching elements, and the energy is transmitted to the secondary side through a high-frequency transformer. This operation uses the on/off frequency, that is, the switching frequency, which is considerably higher than the input AC frequency of 50/60Hz, measuring tens of kHz. The result is a conversion to the square wave illustrated in Figure 5. The method in which the high DC voltage is chopped and converted to AC and then reconverted back to a low DC voltage by rectifying and smoothing is the same as the regular switching DC/DC conversion. 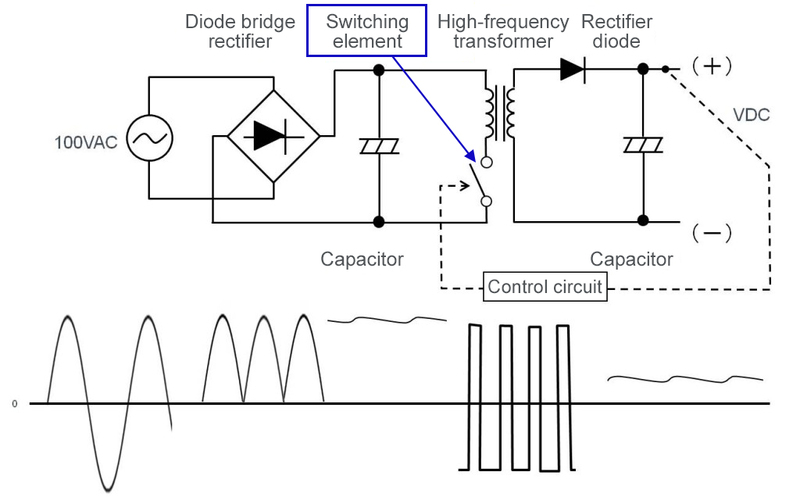 When viewed in detail, the switching DC/DC conversion process involves a DC/AC conversion and then an AC/DC conversion. Incidentally, the linear system DC/DC conversion using a 3-terminal regulator simply converts DC to DC. The principles underlying the conversion of AC to DC through rectification are as explained above. We now briefly describe the principles of the subsequent operation: the DC/DC conversion based on a switching system. Figure 6 illustrates the principles of voltage stepping down using a pulse-width modulation (PWM) system, which is a representative control method. PWM is a control method that controls the on/off time ratio, which is the duty cycle, by keeping the cycle (frequency) constant, and it is used in a variety of applications. PWM converts DC voltage to a required duty-cycle AC by switching, and returns it to DC by rectifying it to produce a desired DC voltage. For example, PWM converts 100VDC by switching to 25% ON of the cycle and the remainder to OFF, resulting in a 25:75 AC. The AC is then rectified and smoothed out, that is, averaged, and converted to DC. The result is 25VDC, or equivalent to 25%. In actuality, DC/DC conversion is power conversion and the conversion efficiency must be taken into account. Thus the result may not be the type of exact equation shown in the figure, nevertheless the conversion is performed based on the principles just described. In addition, as the load current increase, the voltage declines, and the control circuit performs feedback control in order to restore the voltage to a set level by increasing the pulse width. As a consequence, the pulse width does not necessarily remain fixed. In a nut shell, the AC/DC conversion involves rectifying and smoothing out the input AC voltage as is to convert it into DC and re-converting the DC into high-frequency AC, and rectifying and smoothing it to convert to a desired DC voltage. Compared with the transformer system described above, the switching system performs AC/DC conversion twice, which seems complicated. Because this system, which is complicated to be sure, provides significant advantages, recently there have been growing numbers of AC/DC converters employing the switching system. We will discuss the advantages of the switching system later. The photograph in Figure 7 illustrates the components necessary for a switching system-based AC/DC conversion, as well as a circuit implementation example. In basic configuration, the system is the same as the one shown in Figure 5. As such, the circuit controls regulation by providing feedback of the output voltage to a PWM control circuit. While the components are similar to those of the transformer system described previously, in this converter the diode bridges, the primary-side electrolyte capacitor, and the switching elements (transistors) all should meet high voltage-tolerant specification. Because the transformer must operate at high frequencies in a range of tens of kHz, it is referred to as a high-frequency transformer or a switching transformer. The core for a switching transformer is generally made of ferrite. For switching elements, basically transistors are used, which are dubbed power transistors, switching transistors, and the like. The high-power MOSFET for a switching power supply has gained wider circulation. A switching transistor is selected to match the required output power. In situations where the output power is not very high, a control IC containing the switching transistor may be used to reduce the number of components required. The control circuit that regulates the output voltage can be configured by using transistors, operational amplifiers, and other types of discrete devices. In many applications, AC/DC conversion ICs have gained in popularity because of their ability to provide accurate regulation control and a number of protection functions. Especially for on-board AC/DC power supply designs, designing the system with an AC/DC converter IC playing a central role may be a realistic approach. Incidentally, the control IC for the circuit is mounted around the lower center on the back of the board, in a small package called SOP8 providing multiple protection functions in addition to the control function. ・While being more complex than the transformer system, the switching system has become the main stream technology in recent years. ・The design can be made simple through the use of a control IC.